Spring has sprung here but like always it’s not sure if it’s going to stay quite yet. Why is it that Spring has to be the shy season? The weeds chicken food that I’ve actively grown over the winter 😉 is almost overwhelming to contemplate cleaning up feeding to the chickens but the sunshine these last 2 weekends has helped and I even managed a light sunburn. The vitamin D has helped to boost the motivation further yet, as has good company (thanks S and T). 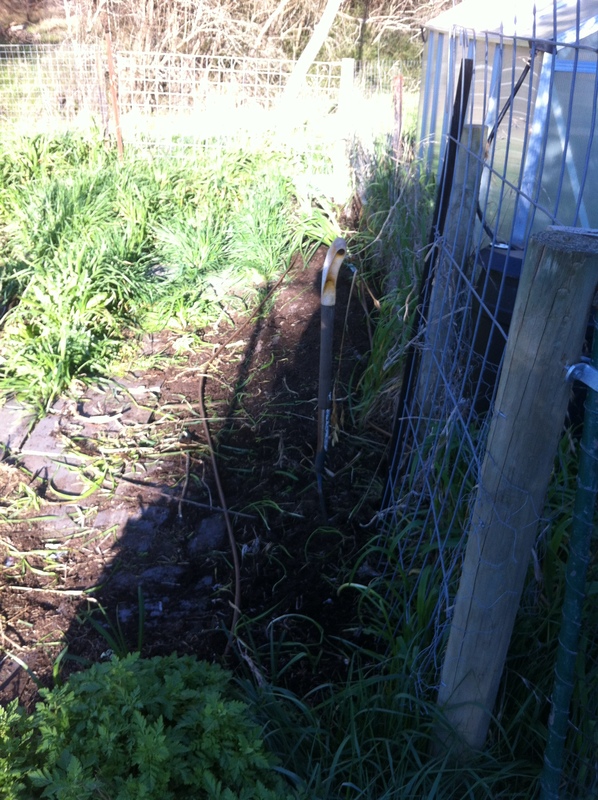 2 beds partly cleared and also partly sown – carrots, snap peas and some very early pumpkin seeds. The time has come to pour some energy (and money 😦 ) into tidying up our gardens. 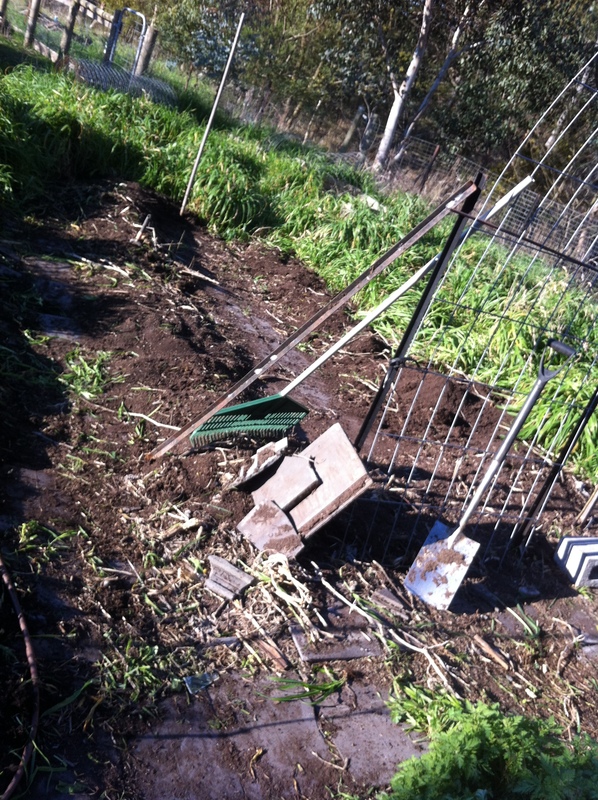 The veggie patch needs nothing more than some hard yakka to find the soil underneath the “green manure” (how many phrases can I come up with to disguise the fact my gardens are a weed fest I wonder 😉 ) then some time spent transplanting seedlings and sowing seeds, etc. 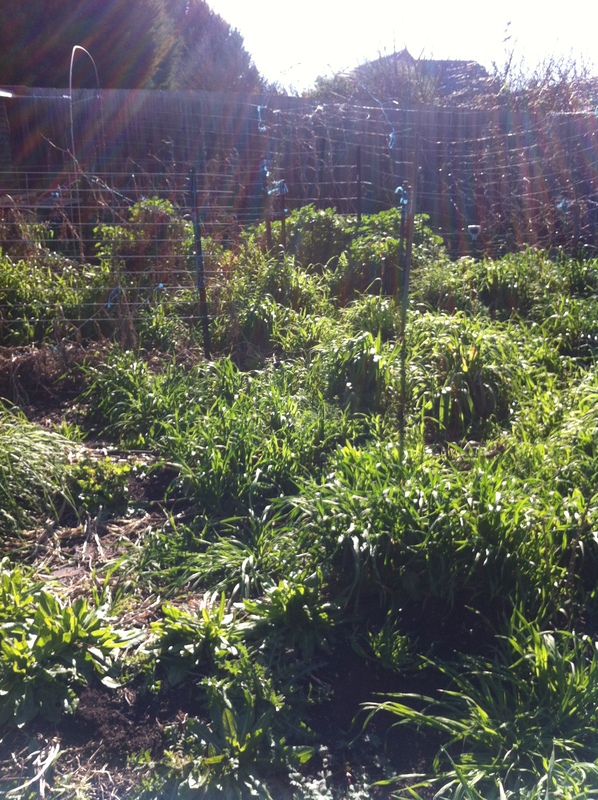 That’s not so bad (as long as you only look at 1 garden bed at a time) but the front is more than a little overwhelming. With the help of some good friends, 8m² of eucalyptus mulch (so far), more hard yakka, several garden tools, 2 wheelbarrows and a few days of sunshine, the front garden is coming together too. We’ve sourced a local supplier of greybox in Maryborough and hopefully the first lot of sleepers will arrive at the end of the week. Here’s hoping the preliminary forecast for fine weather arrives along with them. 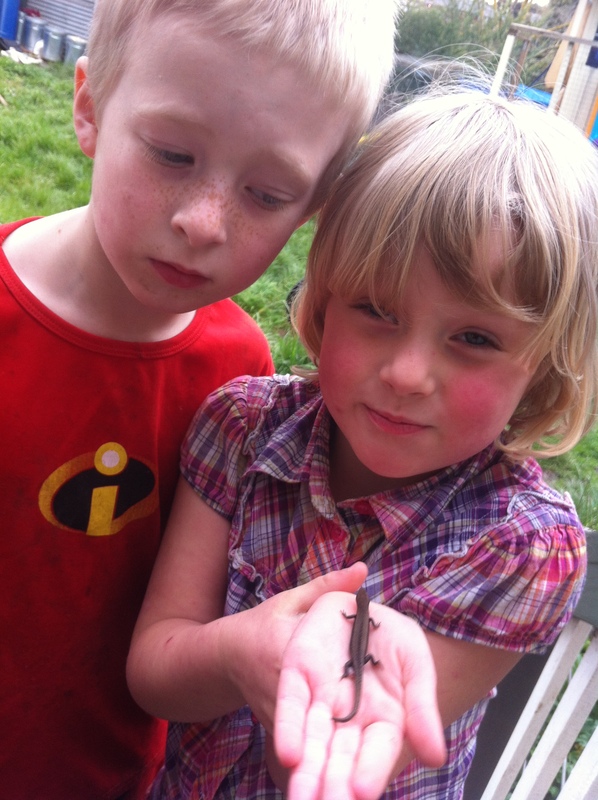 It’s Lizzie the Skink, found on the woodpile, released into the veggie patch. As an aside, my unbelievable daughter was in the garden with me the other day. She picked a leaf, brought it over and asked me what it was. It was a FOUR LEAF CLOVER! I could scarcely believe my eyes! 1st and only leaf she picked. 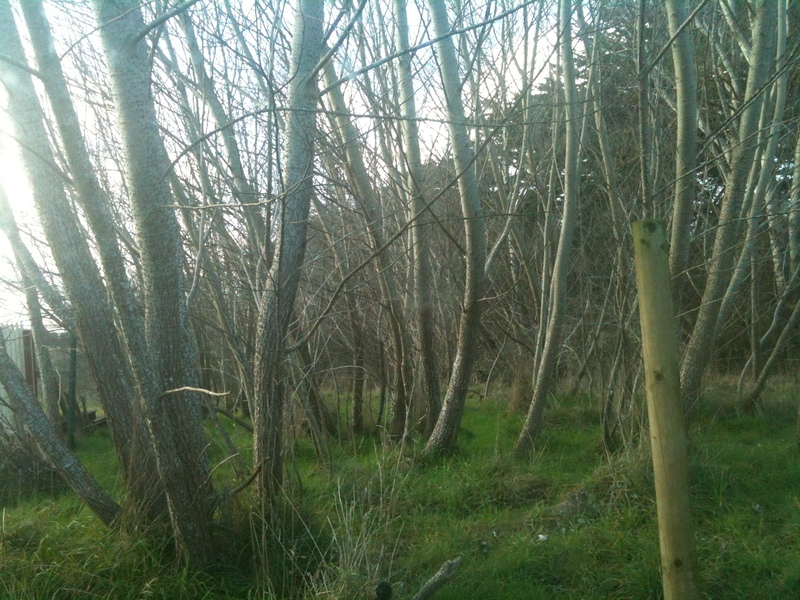 Today, out in the garden with friends I was telling them of Allegra’s incredible find. She tells them how she did it, picks a leaf and brings it over to show us. Would you believe it? 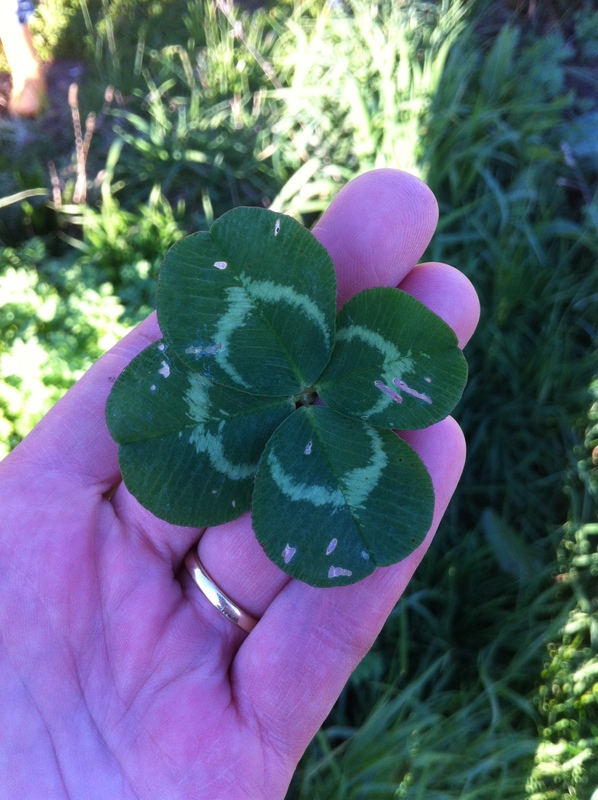 Yep, ANOTHER FOUR LEAF CLOVER! What are the odds?! Both of them are pressing between the pages of my Earth Garden magazine to be laminated for lucky charms. Not that she needs them if she can find them like that! The first 4 leaf clover. It’s 1 in 10,000 chance of finding one. What’s the odds on picking 2 leaves over 2 days and both of those leaves are 4 leaf clovers? A day off and a tour of Angelo’s garden.